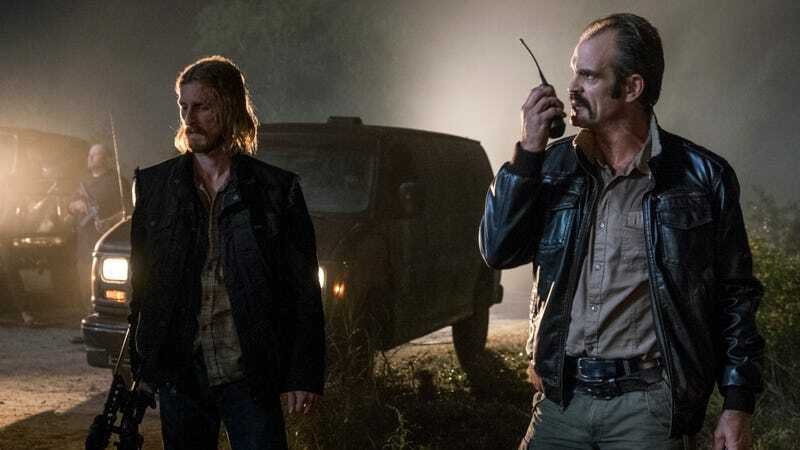 Dwight (Austin Amelio) and Simon (Steven Ogg) get psyched. io9 has an exclusive clip from Sunday’s episode of The Walking Dead, and it’s a good one. Given that it’s an official show promo, I would guess it takes place early in the episode, and so it’s probably not technically that much of a spoiler overall. But I was definitely surprised when I saw what happened in it. Looks like the Saviors’ attack on Hilltop is going to hit a snag, and by snag I mean Maggie totally knew they were coming and prepared a trap and also Daryl is behind them with some sort of automatic rifle. Forget Simon’s plan of taking all of Hilltop out; they’ll be lucky if they aren’t completely routed. Either way, it’s a very inauspicious beginning to Simon’s stint as leader of the Saviors. Honestly, I assumed that since the Saviors usually outgun their foes by a considerable margin and had also added chemical warfare/buckets of zombie guts to their arsenal, Hilltop would be lucky to even make this battle a draw. While the tide could certainly turn afterward, the clip really suggests that the Saviors are going to have their collective asses handed to them, and that’s honestly pretty satisfying. Also satisfying? Simon’s hilariously incorrect belief that it’s better to beg Negan for forgiveness than ask permission—especially when he’s defying his boss’ explicit orders. My guess is whenever Negan gets back to Sanctuary, Simon’s going on a date with a zombie-blood-covered Lucille.